Here's the Big List of Costumes for Halloween and you can find on this site. Click any picture and go to an online Halloween catalog where you can find even more scary, funny or cute costume ideas. Find the perfect style for you whether it's horror, gothic, medieval, renaissance, cartoon, historic, funny, group, couples or even if you are looking for some easy homemade costumes. 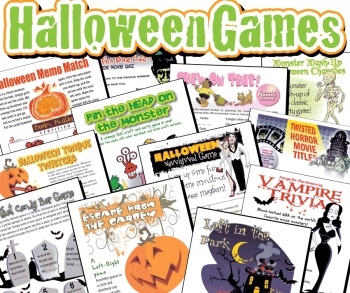 We've got printable Halloween games for kids and adults. Trivia and word games for everyone. Take a look at the party pack you can buy for only 19.95...it includes over 50 Halloween games that you, your kids and family will love to play.